Throw possible because my partner/uke patiently and selflessly participated while I practiced...and practiced! Facebook is about 90% personal and 10% professional. I’ve never been comfortable asking friends for referrals (which is probably why I’m not a natural salesman), but I like friends having a glimpse into what I do for a living. If that generates business, then who better to work with than people you know and trust? I tend to cross-post tweets to Facebook for restaurant/show experiences or my latest elation/disappointment with a sports team. LinkedIn is about 90% professional and 10% personal. In my case, I’m not an Open Networker. I prefer to have shaken your hand and looked you in the eye before LinkingIn. I’ve changed my approach over the last year, and I will now LinkIn if we share common interests/groups…and more so if you have posted references. This is simply too valuable a professional forum, and we truly live in a global community, to restrict relationships based upon face-to-face meetings. I tend to cross-post tweets to LinkedIn that present compelling business news or insight. Twitter is almost 50-50 personal to professional. I get outstanding retweet material from resources like JeffBullas and SocialSteve, and I follow other Social Media and Business Intelligence (BI) news. However, I’ll still express that elation/disappointment with a sporting team, excitement about a judo class, or some “proud Daddy moment”. This venue presents my most complete and relational profile (minus Facebook photo albums)…in 140 characters or less, of course. 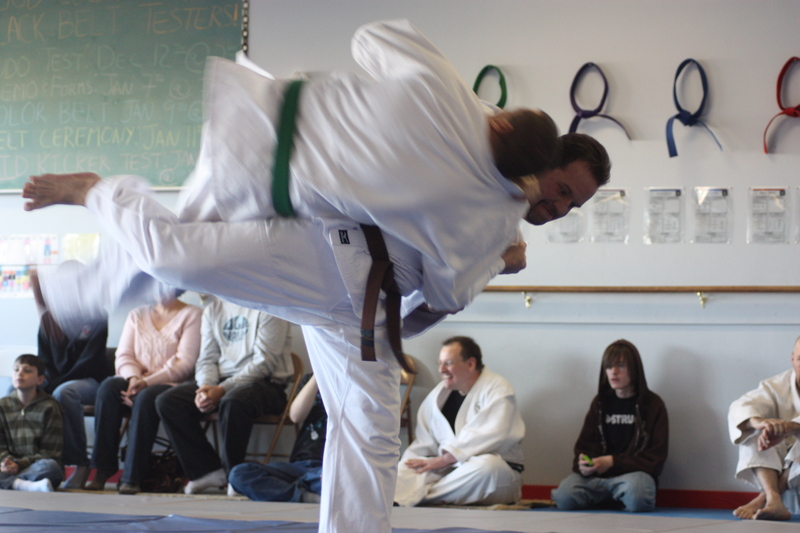 Part of patience within a judo community is working with different skill levels. You need to “give back to the art” by working with lower ranks, and you should expect more senior players to have the same patience with you as you assess your progress. You also need to have the patience to realize proficiency does not happen overnight! I’ve already had a respected member of the social media community patiently correct my Twitter-etiquette (thanks, Steve). I hope to “pay that patience forward” with this blog and an overall active social media presence. Take the time to retweet some of the wealth of knowledge/news that comes across in your feed. Like and Share links in Facebook and LinkedIn. You do not reach shodan in judo in a day…a week…a year. In fact, many people never get to that particular milestone after several years. “Lifers” will go so far as to state that reaching shodan just means you are now ready to start learning. But if you do not practice, you find other distractions and walk away from a great sport…or simply stay in a rut in terms of proficiency at the sport which can lead to frustration. Commit to following your social media touchpoints daily. Become engaged and invested with the people you choose to follow, friend or link with. As you contribute to those relationships, you will better understand Jita-Kyoei: Mutual Welfare and Benefit!! What’s your opinion? Are you already patiently and selflessly participating and practicing daily? How do you separate your Facebook, LinkedIn and Twitter identities relative to your professional and personal life? Nice blog Bryan! There are many sports analogies for managing this new social interfaces, so I appreciate your theme. A judo dojo is a perfect example of a rich social environment where tuning to productive interaction is the key to learning expanding one’s capabilities. Thanks for providing some thoughtful lessons from that environment for the use of social media. Thanks, Erik. I’ll try to mix it up with the sports analogies. Of course, I had to get a March Madness post in there before the tourney was over, so I hope you enjoy the next one! Great job on the write up… I consider myself a lifer that unfortunately do to life demands will not get past Brown. The competition the other week was lots of fun.